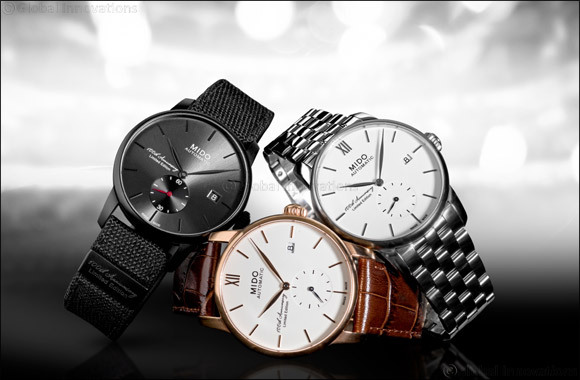 Dubai, UAE, June 13, 2018: Swiss watchmaker Mido is launching a trilogy of limited editions based on the theme of “past, present and future” to illustrate its timelessness and to honour its watchmaking heritage. In 2018, the brand is marking its 100th anniversary by celebrating the values that have formed its DNA for a century: timeless design, high quality materials, and technical innovation. A continuation of the Baroncelli collection, inspired by the Rennes Opera House and its incredibly rich aesthetic appeal and technical mastery, the three models embody different periods of the brand's history as well as its resolutely forward-looking mindset: the years 1918, 2018 and 2118. The Rennes Opera House is an operatic landmark characterised by its distinctive rounded architecture. The harmonious lines and subtle curves, typical of the neoclassical tradition, make it a particularly outstanding monument. The sophisticated forms of the Baroncelli collection pay tribute to the timeless elegance of this building. Based on the Baroncelli model in polished 316L stainless steel, the three watches have a diameter of 38 mm, with a three-piece case that houses a finely decorated Elaboré-grade movement. These numbered timepieces are adorned with the 100th Anniversary signature and are issued as limited editions of the same number of pieces as their respective dates.